As soon as I saw Liz Harvatine’s January Quilt block pattern, I knew I had to make my own version. Her designs are always so interesting and her piecing skills leave me in awe and wondering how exactly she puts everything together. I made this quilt at the beginning of April for Sarah's birthday. Both she and Liz have been such an inspiration to me over the years and I knew I wanted to use a special pattern for Sarah's quilt. This quilt probably has over 100 different fabrics in it; I used all of Sarah's favorite colors--blue, green, orange, and red. One common bond we share is our love for cute fabric and, of course, shopping for said fabric. One bond we don't share is my love of purple! For the back of the quilt, I pieced random strips of fabrics together to form a colorful mosaic. I'm on a fabric fast until the beginning of August and didn't have matching yardage for the backing. 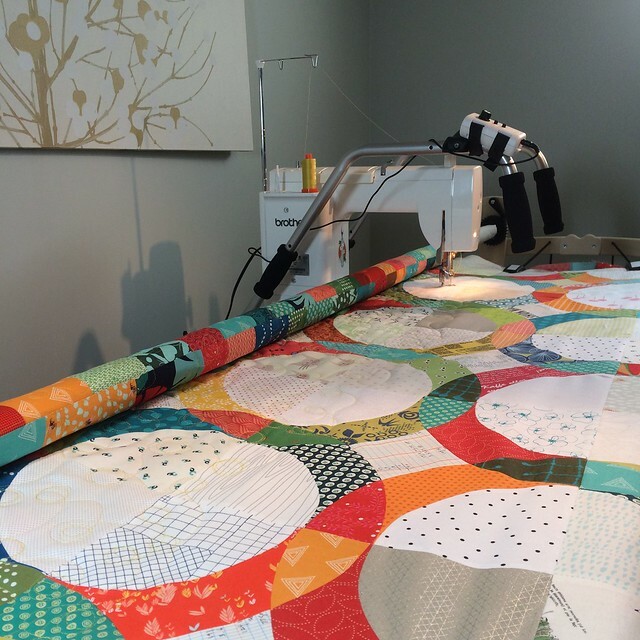 I quilted this on my new Gracie Queen frame that's set up with my Brother Nouvelle 1500s. 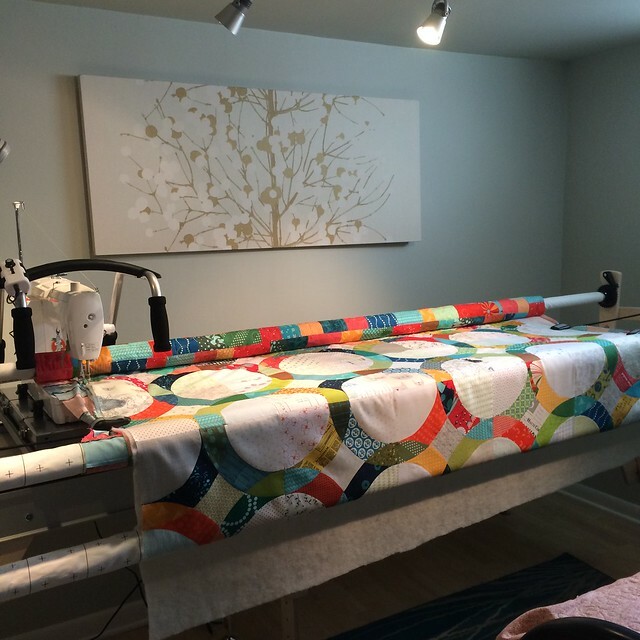 It was so much fun to quilt and a lot easier to maneuver everything around on the frame. 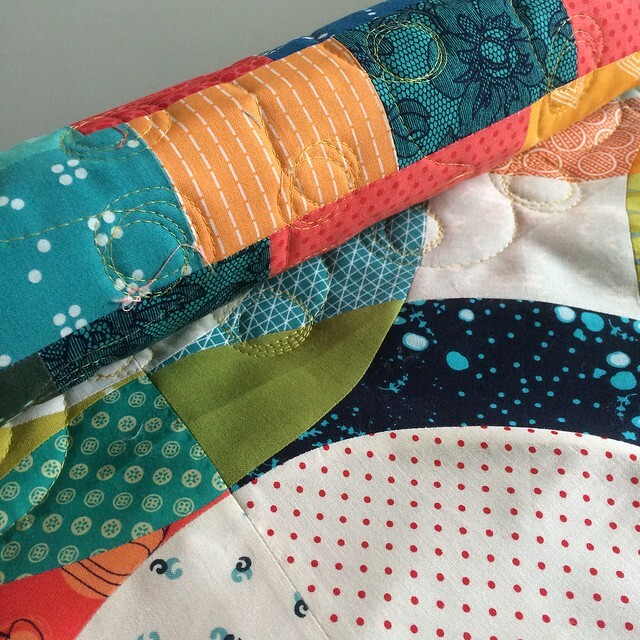 I have a queue of quilts that are ready to be quilted and just need to find some time to tackle my unfinished projects! If you’re looking to sew with curves, I highly recommend Angela Pingell’s book, A Quilter's Mixology. It’s filled with beautiful patterns and helpful techniques. One new tool I found at Quilt Con is the Bloc Loc Drunkard’s Path ruler set. This is a three piece set with two acrylic cutting templates and one acrylic piece to use to square up your block. The square-up piece has a curved groove the size of your seam allowance, so it locks your block in place for cutting (hence the name!). 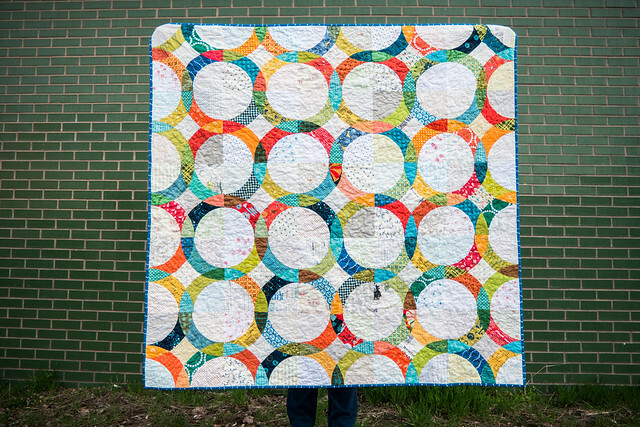 One of my next quilts will definitely be a drunkard’s path design! The biggest tip I can share for piecing curves is to place the convex piece face up on the bottom and then concave piece face down on the top. Then slowly stretch and curve the concave piece to fit the convex piece as you sew the quarter inch seam. Having a ¼” foot with a right side guide is helpful to make sure that you’re maintaining a ¼” seam throughout and it gives something for the curved seam to line up against as you sew. 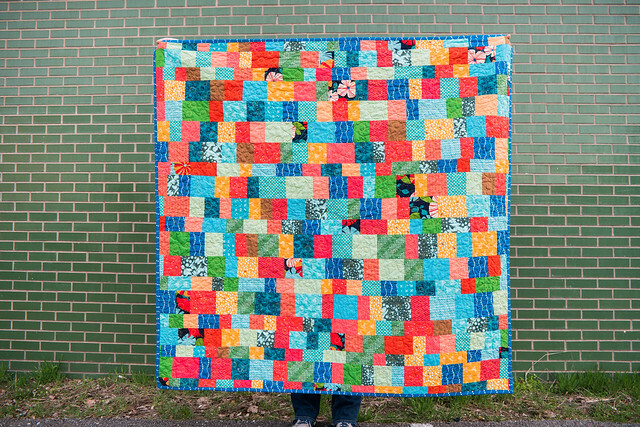 This is my Spring Blogger's Quilt Festival entry in the Scrappy category.